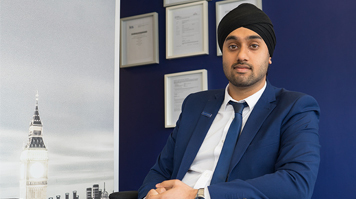 After starting in negotiation and letting, Harmit is now the Sales and Letting Manager at Hunters in Hounslow. “I’ve been able to move up quite quickly thanks to the experience and understanding I gained from my time at LSBU,” he says. In fact, Harmit is so busy that he cites managing his time effectively as his biggest challenge. The proximity of his branch to Heathrow means he is often busy dealing with IT contractors on short-term contracts needing places to stay at short notice and, with over 75 other agencies operating in the same area, Harmit can’t afford to become complacent. In such a competitive area, Harmit really believes that his degree helps him to stand out from others in his industry. “Having a degree in the field is really important, and I would definitely advise anyone thinking of moving into the industry to do the same as I did,” he says. “The degree at LSBU is even better because it is accredited by the Royal Institution of Chartered Surveyors, a group I am still a member of today." Clients who are spending a lot of money want to know that the person they are dealing with have knowledge, experience and expertise, and my RICS membership – made possible as a result of my degree – really helps me get that across. Read more about studying BSc (Hons) Property Management (Building Surveying).